Jumbo Q-Man Magnet: Giant-sized version of the popular flexible figurine. Let someone else hold your stuff for a change. 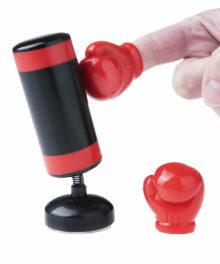 Give your memos, photos, and child’s doodles to the Jumbo Q-Man Magnet, and he’ll hold them all for you. 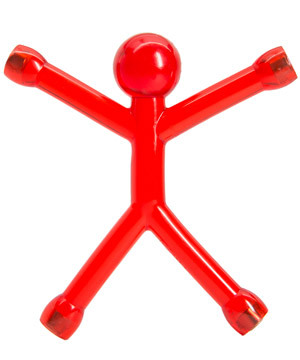 This giant-sized Q-Man has a magnet in each of his extremities, so he can cling to your fridge or filing cabinet while he hoists your treasures. At nearly ten times the size of his little brothers, this big boy comes in three translucent colors: blue, green, and red. Each big dude also has the flexibility to do more than just hold things to your fridge. 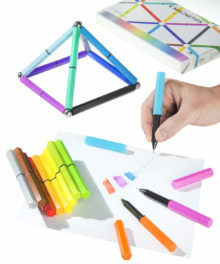 The PVC rubber easily bends, so with several Jumbo Q-Men, you can make a pyramid, do a little Q-Man yoga, or recreate a scene from Cliffhanger. As the old saying goes, if it ain’t broke, make it bigger... yeah, that sounds right. The Jumbo Q-Man is all the fun of its little brother in a larger, stronger body. Put him on your filing cabinet, have him hold paper clips and tacks, or just play with him while you’re in between tasks. 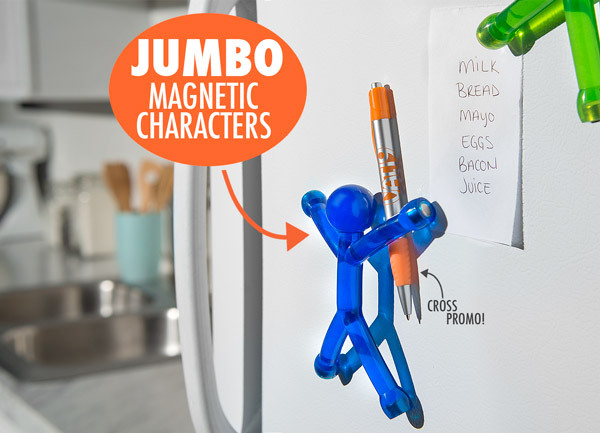 The Jumbo Q-Man is also known to help out on the refrigerator. More like Jumbo Cute Man. 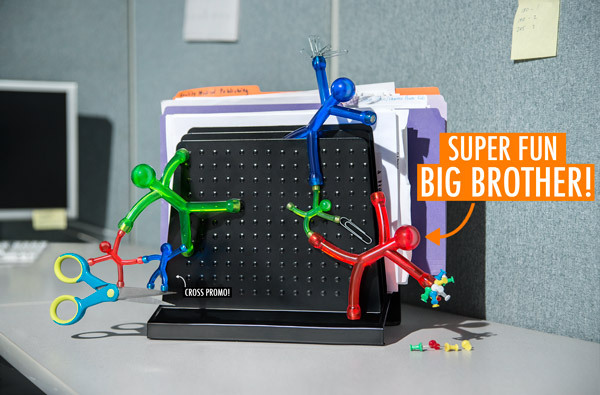 A Jumbo Q-Man must possess great strength in all of his extremities if he’s going to tackle the daunting task of keeping you occupied at work. That’s why this mighty man has a large neodymium magnet in each of his four limbs. Using two appendages, a pair of magnets is strong enough to hold over a dozen pieces of copy paper or your car keys. 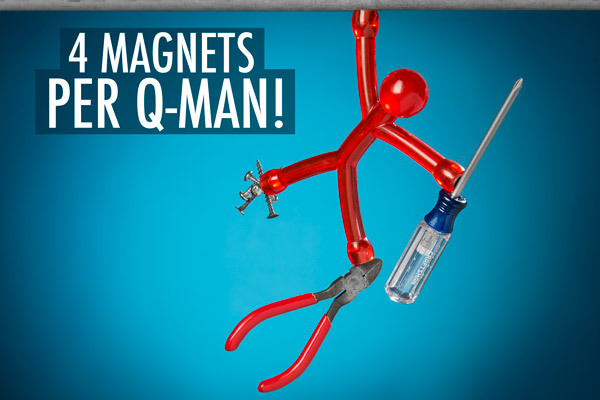 With his 4 magnets, the Q-Man would make quite the superhero! Jumbo Q-Man wouldn't be jumbo if there weren’t little siblings to compare him to. 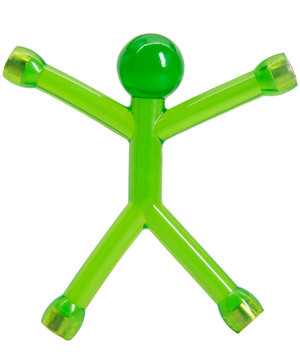 Let him play with the mini translucent or solid Q-Men, and we’re sure he’ll be on his best behavior. 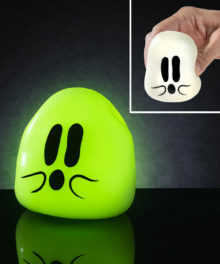 When things start to get dark, he can even find his old pals, the tiny Glow-in-the-Dark Q-Men. A good man is hard to find, but finding a good Q-Man just depends on your color preference. 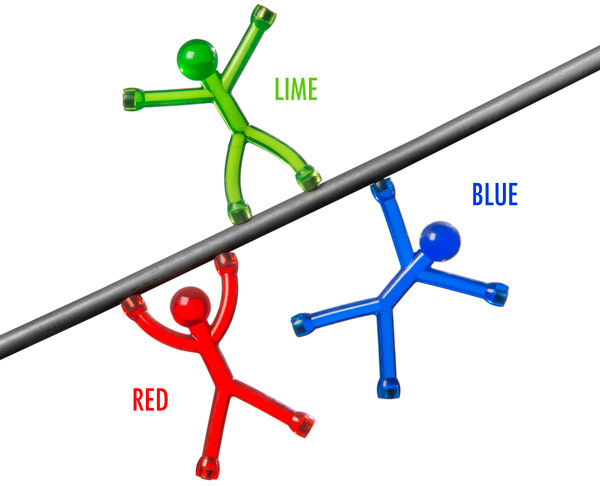 Choose from blue, green, and red varieties. Of course, Jumbo Q-Men like to stick together so you could just get all three (hint, hint). Question: Are the magnets larger than the other Q-Men? Answer: Yes, the magnets are substantially larger and can hold more weight. Question: Are these good toys for kids? 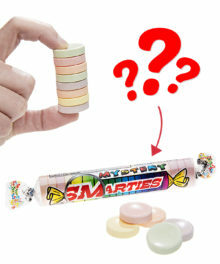 Answer: Since they contain magnets that could be pried loose, we don't recommend the Jumbo Q-Man for any child under 8.